"European Pillar of Social Rights: Going beyond politics and economics"
The European Pillar of Social Rights was jointly proclaimed and signed by the European Commission, European Parliament, and the Council at the Gothenburg Social Summit in November 2017. The European Institutions hold regular high-level meetings and dialogue seminars with churches, non-confessional, and philosophical organisations as partial fulfilment of Article 17 of the Treaty on the Functioning of the European Union. Economic and political challenges have hurt the quality of life for many in Europe. Risk of unemployment and poverty remains high, many deal with precarious and unstable work, unpaid or underpaid internships are on the rise, and Europe is falling short of many goals outlined in the EU 2020 strategy. Interreligious Leadership Conference took place in Wien, on 28 – 29 April 2018, hosted by Universal Peace Federation, International Association of Parliamentarians for Peace, Interreligious Association for Peace and Development. Raffaella Di Marzio, very appreciate collaborator of Soteria International, spoke on Saturday April 28 afternoon, in Session III on the theme “The Role and Relevance of Religion in Building Inclusive, Peaceful and Prosperous Societies”. Dr Raffaella di Marzio (Director, Center for Studies on Freedom of Religion, Belief and Conscience (LIREC), Italy) spoke on the positive influence of religion in society, referring to a number of studies, including an awareness project on minorities, the role of interfaith dialogue in conflict resolution, and religious freedom as a positive influence on economic growth. On May 14, 2018, a new online news magazine has been launched at the International Book Fair of Torino, in Italy, Bitter Winter. The name refers both to the difficult situation of religious liberty in China and to a theme in classical Chinese painting. The launch of Bitter Winter came at the end of FIRMA-Faiths in Tune, a five-day festival of religions and music that ran parallel with the Book Fair. At the Book Fair, two FIRMA awards were presented by an international jury, one to President Daisaku Ikeda of Soka Gakkai for his lifelong commitment to religious dialogue, and one to The Church of Almighty God, a Chinese new religious movement, for its resistance to religious persecution in China. Authorities, journalists, and a significant public attended both the festival, where The Church of Almighty God’s performers were among the most admired groups, and the award ceremony. As we all know, it is a major obligation of all EU member states to respect and protect the freedom of conscience, thought and religion and to combat discrimination, and substantial resources are invested to diminish the symptoms of discrimination and non-tolerance. Still, discrimination and non-tolerance continue to challenge our societies. Public fear and ignorance regarding unfamiliar religious traditions has increased. Discrimination and hate speech increasingly target religious minorities or New Religious Movements and the public debate is increasingly harsh on any group that is considered unfamiliar to society. This reaction on unfamiliar thoughts and religions started at the end of the last millennium, with France and Belgium’s arbitrary sect lists. Instead of discussing ideas and insights, criminal intent was brought into speculation behind the ideas of witchcraft, subversive plans and mind manipulation. Volunteer work in new spiritual communities is called human trafficking, a consensual love affair is called sexual abuse, etc. The experience demonstrated by humankind so far, indicates that often legality prevails over righteousness, but when things are considered just as an exclusive result of legislative decisions, human rights can miss the ethical and moral dimensions. The situation of the Religious Freedom is a reason of concern for several NGOs. The 15th March 2018, on the occasion of the 37th session of the Human Rights Council at the United Nations (Geneva), the french NGO with United Nations Consultative Status, the Coordination of the Associations and the People for Freedom of Conscience (CAP LC) organised an event on the topic of the Deterioration of Religious Freedom in Eastern Europe. It was focused on those following countries where this deterioration is unfortunately the most relevant : Romania, Czech Republic, Hungary and Russian Federation. The World Interfaith Harmony Week was proclaimed by the UN General Assembly on 20 October 2010. In the resolution, the General Assembly, points out that mutual understanding and interreligious dialogue constitute important dimensions of a culture of peace and established World Interfaith Harmony Week as a way to promote harmony between all people regardless of their faith, all done on a total voluntary basis. Center for Dansk-Muslimske Relationer- www.cedar.nu ; EMISCO- www.emisco.eu ; ENAR- www.enar-eu.org ; Soteria International - www.soteriainternational.org ; Youth for Human Rights - www.ungeformenneskeret tigheder.dk ; United for Human Rights – www.humanrights.com ; Vejen til lykke – www.vejentillykke.dk The Danish Baha'I Community - http://www.bahai.dk/ ; Scientology Volunteer Ministers - https://www.freedommag.org join the WORLD INTERFAITH HARMONY WEEK, creating an event together and in this way celebrating the inclusiveness of all faiths in our lives. Date & Time: SATURDAY, 3 FEBRUARY 2018 from 13.00 – 16.00. Address: Tent city at Nytorv, Copenhagen K.
International Convention "Law and Freedom of Belief in Europe, an Arduous Journey"
On the 18 - 19 January one of the biggest events in the field of law and human rights took place, which gathered together 32 speakers from around the world, among which also a representative of Soteria International. "In the prestigious setting of Sant'Apollonia Auditorium at the homonymous XIV century convent complex located in Via San Gallo, in the historic center of Florence, the international convention of the European Federation for the Freedom of the Belief (FOB) took place, under the auspices of the Secretary General of the Council of Europe (Dr. Thorbjørn Jagland), of the patronage of the Tuscany Regional Council, of the Parliamentary Assembly of the OSCE (Organization for Security and Cooperation in Europe) and of the University of Florence. The Medal of the President of the Italian Republic was conferred to the convention. Prof. Silvio Calzolari (Secretary of FOB), presenting it together with attorney Alessandro Amicarelli (President of FOB), publicly thanked the President of the Republic “for having expressed his appreciation for FOB’s initiative, as an event of particular cultural and social value, through the attribution of a representation prize, a medal, which honors us". On Monday, January 15, Soteria International attended a side-event following the Universal Periodic Review of France at the United Nations in Geneva, Switzerland. In accordance with the views expressed at this meeting, research conducted by Soteria International has also concluded that French funding of anti-cult organizations, such as FECRIS and its member organizations, leads to stigmatization of spiritual practitions and the violation of the right to Freedom of Religion. This government funded "hate speech" has allowed this discourse to greatly affect the views of society at large, not only in France, but also accross Europe. CAP/ LC HRWF (15.01.2017) – In a side-event following the Universal Periodic Review of France in Geneva this Monday 15th January, several NGOs and an international law expert have called upon President Emmanuel Macron and his Prime Minister to revise the financing of FECRIS (European Federation of Centers of Research and Information on Cults and Sects) and its member organizations. Under the predecessors of President Macron, FECRIS has benefitted from abusive grants that they have used to disseminate hate speech targeting some minority religious groups in the countries of the European Union and beyond. The representative of the French NGO CAP/LC (Coordination des Associations et des Individus pour la Liberté de Conscience), Mr. Thierry Vallé, highlighted the French policy stigmatizing religious minorities and the human consequences which are often dramatic for the members of these minorities. By financing FECRIS, France contributes to the expansion of this phenomenon in Europe. On the occasion of the 70th anniversary of the Universal Declaration of Human Rights, France must reconsider its policy regarding religious minorities, he added. International Convention "Law and Freedom of Belief in Europe - An arduous journey"
European Federation for Freedom of Belief - FOB, a Federation of Associations that advocate freedom of thought, religion and belief, will organize, under the auspices of the Secretary General of the Council of Europe, Mr Thorbjørn Jagland, and under the patronage of OSCE - PA, on 18 - 19 January 2018 at Auditorium Sant'Apollonia, Firenze - Via San Gallo, 25/a the International Convention "Law and Freedom of Belief in Europe - An arduous journey". "Within globalization, within pluralism, in a multi-ethnic society, with the many exoduses and with the diversities bursting into our society, protection of civil rights and especially the right to believe and the right for freedom, have become a crucial need for the European Community and the national governments that comprise it. In an uncertain and volatile reality, that protection is our duty and the duty of each country, and the only way to make it valid and effective all over Europe and in each and every country of the Union, is to have European laws as well as European justice enforcement bodies. With the differences of laws and rulings of each national government, with the pressures of anti-liberal forces and sometimes of nonsense politics, it is not an easy task, the one we are entitled to. Within the protection (with no shyness) of freedom to believe and freedom of religion, dwells a hope for peace, for pacific cohabitation and reciprocal acknowledgment which alone turns the different, the ‘other’, the unknown, into a comrade, a friend and a fellow citizen. In such often puzzling protection stands the creation, as well, of the most truthful identity for Europe and its role amongst the nations and continents." On December 10, Soteria International, Youth for Human Rights Denmark, and ENAR Denmark, hosted the 10th Annual Spiritual Human Rights Conference in Copenhagen, Denmark. Human rights activists and spiritual practitioners gathered to discuss the success of the past decade and directions for the future in order to improve on the current situation. The conference was chaired by Konrad Swenninger from Soteria International, who introduced this 10th Annual Spiritual Human Rights Conference by stating the importance of the spiritual aspect of human rights, as mentioned in the preamble to the UN Declaration of Human rights, that spirituality is in fact the base of human rights. Mr. Swenninger gave a short introduction to the topics undertaken in the previous conferences, leading to the topic of this year’s SHR conference, and emphasized the importance of the partnerships and collaborative efforts of the individuals and organizations present. Several Human Rights NGO's took a stand and began to raise their concern on the persecution of the Church of Almighty God in China, as well as, the propaganda against the group in Korea, Hong Kong, and Taiwan. Thousands of members of the Church of Almighty God (CAG) have been incarcerated in China, following a further crackdown on unauthorized religious organizations. According to the rough statistics, more than 300,000 members of CAG were incarcerated and detained in China from the beginning of the persecutions in the 1990s to 2017. Many have been tortured and at least 30 died in custody in suspicious circumstances, according to a report just released by CAG and published by several human rights organizations internationally (see e.g, http://www.cesnur.org/2017/almighty_china_report.pdf). In the last few days, we have seen unprecedented media attacks against CAG published simultaneously in Korea, Hong Kong, and Taiwan, which seem to be an answer to the publication of this report. The Church of Almighty God (CAG) is a new religious movement founded in China in 1991. It teaches that Jesus has returned to the Earth and incarnated as the Almighty God in a living person and is with us today. It also claims that prophecies in the Bible predict the fall of the Chinese Communist regime in China, although it does not advocate any form of armed rebellion. For this reason, CAG, credited by Chinese official sources with a membership of at least three million, has been persecuted massively since at least 1995. The Chinese regime later started accusing CAG of various crimes, including causing riots based on a prediction that the world would end in 2012 and murdering a woman in a McDonald’s diner in Zhaoyuan in 2014. The recent media campaign repeats these accusations, although scholarly studies have debunked them as egregious examples of fake news spread to discredit CAG. In fact, the group responsible for the 2014 murder used the name “Almighty God,” but was not part of CAG and had different religious beliefs. Even studies hostile to CAG have concluded that, although some CAG believers expected the end of the world for 2012, this was not sanctioned by the leaders, was not part of CAG’s teachings, and did not lead to any riots. This year at the OSCE's Human Dimension Implementation Meeting 2017 in Warsaw, representatives of the Church of Almighty God (CAG), contacted the delegates of Soteria International and presented the challenges their organization was facing in China. It is important to raise concern with regards to their situation and to make their case more known, thus helping them to attend their fundamental rights. The Church of Almighty God, established in 1991, has released it's annual report "2017 Annual Report on the Chinese Communist Government’s Persecution of the Church of Almighty God"detailing it's persecution in the People's Republic of China. The report provides a history of the persecution of the Church, and documents individual cases of persecution. The Church of Almighty God (CAG), also known as Eastern Lightning, has long been one of the most severely persecuted Chinese house churches by the Chinese Communist government. Since its establishment in 1991, the CAG has continued to endure the brutal repression and persecution of the Chinese Communist government. In 1995, the CCP government used trumped-up charges such as “fraud in the name of religion, Qigong” and “deification of their leading members” to condemn the CAG as an “evil cult” and brutally repress and persecute the CAG. According to rough statistics, in just the two short years between 2011 and 2013, the number of Christians of the CAG illegally arrested, detained and sentenced by the Communist Party reached 380,380 people, of which 43,640 people were subjected to various methods of torture at the hands of kangaroo courts, including 13 people who were persecuted to death. As of now, there are already 44 well-documented cases of Christians of the CAG killed by the Communist Party. In 2017, the repression of the CAG by the Communist Party continues to escalate. Invitation to the Tenth SPIRITUAL HUMAN RIGHTS Conference, 10 December 2017 – Next level! Its been ten years. Soteria International has grown steadily in the pursuit of securing fundamental freedoms and Spiritual Human Rights for all. We want to celebrate a decade of success, as our perspectives have been heard, shared and spread all over Europe. Experts, politicians and human rights activists have shared their faith in our principles and commitment! Despite the reach of our ideas and the positive feedback that followed, we have witnessed a growing trend in the society towards distrust, fear and suspicion regarding the intrinsic value of spiritual human right. Moreover, this trend is fuelled by mainstream media, and the law-makers and governments around Europe seem more inclined to listen to fear-mongers and social media thought-police. The risk here is that, for fearing the spontaneous and creative nature of man's spirituality, the State is inclined to trample over the individual's basic human right, and far too often this is done in the name of the 'greater good'. As such, we have witnessed a decade of increased surveillance, increased xenophobia and an ever narrowing perspective on what is considered” normal” and acceptable within the society. So, while celebrating our success in defending the spiritual rights of people all over Europe, we must also be prepared to live up to the increased challenges that are already here. Let us prepare for a decade of effective actions, not just words. Let us explore new ways to awaken the courage needed to live life fully, as complete and free human beings. The tenth Spiritual Human Rights conference calls on all of us to be the guardian of the fundamental rights of people around us no matter their religion and culture, and never to let fear and ignorance be the measure of our hearts and freedom of conscience. With the United Nations Universal Periodic Review (UPR) for the Czech Republic coming up next month, a Round Table National Pre-Session for the UPR of the Czech Republic was held in Prague on October 4, 2017 in order to provide foreign country delegates with the most up-to-date and accurate information regarding the current human rights situation in the Czech Republic. This autumn, the delegates will meet in Geneva in order to present their recommendations in this international forum. In Section C- Anti-discrimination legislation from the National Report submitted at the Working Group on the Universal Periodic Review, Fourteenth session, Geneva, 2012, at point 29, we find references to the Anti-discrimination legislation, which is based on the constitutional principles of equality in dignity and rights, and on the prohibition of discrimination on illegitimate grounds. As religion, belief, or world view are among the rights which should be protected and not grounds for discrimination, the event served as an opportunity to raise the attention of participants to a possible misunderstanding of religious practice in the Czech Republic. Soteria International, the only foreign organization present, was invited to speak on the topic of the effects of globalization and new religious movements on the development of freedom of conscience, thought, and religion, within the national framework of a case that is currently taking place in the Czech Republic. Along with a network of scholars, religious leaders, and human rights advocates and practitioners, Soteria International collaborates in order to raise awareness of the growing number of people adopting a spiritual perspective on life, who are often met with a resistant misunderstanding of newly emerging values and principles in society. In some cases, this misunderstanding leads to governmental and institutional intolerance and misunderstanding towards new spiritual and religious movements. This year at the OSCE's Human Dimension Implementation Meeting (HDIM), HRWF brought forth, once again, the case of Jaroslav Dobes ('Guru Jara') and Barbora Plaskova, two Czech nationals who are currently detained in the Philippines due to their inability to acquire valid Czech passports. This is a case, which Soteria International has followed closely since 2014, having conducted an extensive fact-checking mission and subsequent advocacy for. Two Czech citizens, Barbora Plaskova and Jaroslav Dobes, have been respectively detained in the Immigration Detention Center of Bagong Diwa in the Philippines since April and May 2015 on the grounds that their passports were no longer valid. Jaroslav Dobes and Barbora Plaskova have been living and working for years as yoga teachers in the Philippines and each of them has a child born in the country. On 14th April 2015 Barbora Plaskova went to the Czech consulate in Manila, in the Philippines, to prolong the validity of her passport but she was denied a new one and she was kept in the Immigration Detention Center in Manila where she still is. On 15th May 2015, Jaroslav Dobes, was arrested in Surigao del Norte, in the Philippines, where he openly exercised his activities of yoga teacher because his passport was not valid any more. He was immediately sent to the Immigration Detention Center in Manila where he still is. Both Czech citizens were hereby left “undocumented” by their embassy in the Philippines. In Prague, the authorities requested and obtained from Interpol the issuance of an international arrest warrant against Jaroslav Dobes and Barbora Plaskova. Our organization, along with the Forum for Religious Freedom – Europe, takes this opportunity to raise once again what is arguably the most flagrant assault on religious freedom to occur in the Euro-Atlantic region since the end of the Soviet Union and its satellite communist regimes in Eastern Europe – namely, the Russian Federation’s illegal ban on the Jehovah’s Witnesses. As we meet here today, Jehovah’s Witnesses, who are charged with membership in an “extremist” organization, are being prosecuted for no other crime than their religious faith. The ban was confirmed by the Russian Supreme Court on the 20th of April 2017. The law makes it a crime for about 170,000 Russian citizens to practice their faith. The denomination has faced increasing persecution in Russia for decades. Indeed, we have warned about the growing persecution of members of this group in Russia for 13 years. Dennis Christensen, a Danish citizen, was arrested for attending a religious meeting of Jehovah’s Witness and was sentenced to a 2-month pretrial detention that has been extended until 23 November. Russia is thus incarcerating a prisoner of conscience in this case. Still, this unprecedented restriction on the fundamental human right to freedom of religion, a right the Russian Federation is committed to protect as a signatory to the Helsinki documents, and under legal treaty obligations, has been met with only limited and muted criticism. More often than not, the ban has been met by silence indicating indifference. International reaction has not been consistent with the gravity of this massive violation of human rights. Along with Soteria International, many other NGOs working towards the respect of human rights are involved in revealing the harmful activities and impact of anti-sect organizations. 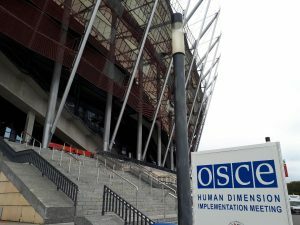 Each year at the OSCE's Human Dimension Implementation Meeting in Warsaw, the issue of anti-sect organizations is raised with yet new examples of abuses committed since the last meeting. Does the problem persist due to a lack of political will? Coordination des Associations et des Particuliers Pour la Liberté de Conscience (Coordination of Associations and Individuals for Freedom of Conscience, or CAP) is one of the organisations with whom Soteria International collaborates. At this year's OSCE HDIM, CAP exposed, yet again, the harmful impact of FECRIS, a supposed non-government organisation claiming to be fighting against the abuse of individuals by 'sects/cults', yet whose work is almost entirely funded by the French state. CAP is an association that was created in 2000 to unite minority religions in Europe to counter discrimination in France and in Europe. It has NGO consultative status with the Economic and Social Council of the United Nations. During the last OSCE session on freedom of religion or belief in September 2016, CAP exposed the harmful activities of FECRIS (the European Federation of Centres of Research and Information on Sectarianism) in Russia and its integral financing by the French Government. Members of FECRIS and of its Russian branch, the Saint Ireneus of Lyons Centre for Religious Studies which is affiliated to the Orthodox Church, have been waging for years a campaign against non-Orthodox minorities in order t o eradicate them from the Russian territory. Alexander Dvorkin, Vice-President of FECRIS and Director of the Saint Ireneus of Lyons. [Dvorkin] is the major spokesperson and activist in th is campaign against religious minorities in Russia. For years, NGOs have been advocating for and warning about the dire situation of women around the world being accused of, and subsequently abused, on the grounds of witchcraft. Cross-culturally, it is difficult to define the terms ‘witch’ and ‘witchcraft,’ which can signify various different traditions or faith healing practices depending on the context. With a lack of definition, there is also no normative framework or formal mechanism which ensures effective response or monitoring of human rights violations based on ‘witchcraft’. 21-22 September 2017, has marked a ground-breaking step towards prioritizing this issue. The United Nations Human Rights Council, in Geneva—in collaboration with multiple Permanent Missions to the UN in Geneva, NGOs, and Lancaster University—has hosted an expert workshop on witchcraft and human rights, gathering civil society, country representatives, UN experts, and academics to discuss solutions to this practice. "Anti-sect movements and State neutrality: FECRIS and its member associations in France"
As stated in the report “Anti-sect movements and State Neutrality," published by Dresden University, the activities undertaken by anti-sect organizations are often personally motivated, run by a small number of individuals, and are given an undemocratic position as experts within many European judicial systems. Patricia Duval is an International Human Rights lawyer in Paris, France who has defended the rights of religious minorities in national and international cases. She has defended and spoken before institutions such as the European Court of Human Rights, the Council of Europe, the Organization for Security and Co-operation in Europe, the European Union, and the United Nations. At this year's OSCE HDIM, Mrs. Duval spoke to the OSCE, country delegates, and civil society representatives regarding anti-sect movements and organizations in France. The European Federation of Centers of Research and Information on Sectarianism (FECRIS) has 3 member associations in France which are all three financed for over 90% of their budget by public funds. FECRIS itself has been financed nearly entirely by the French State with a ratio over 92% of public funding compared to its private memberships since 2001. In the 1980s, private anti-sect associations started to appear in France, created by parents who disagreed with the choice of their overage children to adhere to minority belief groups. Such was the case of UNADFI (the National Union of Associations for the Defense of the Family and the Individual) and CCMM (the Center Against Mental Manipulations). The first Association for the Defense of the Family and the Individual (“ADFI”) was created in France in 1974 by a Doctor (Champollion) whose son of 18 joined the “Unification Church”. Dr Champollion and his wife studied the basic books of the group and disagreed with the beliefs they outlined which contradicted their own, as they deemed that the group’s literature contained unfounded statements on the history of humanity (since the Creation) and the Biblical Exegesis. Mr. and Mrs. Champollion met other parents whose children had also joined the Unification Church. They started to have long discussions with them, Bible in hand, to try to have them recount their newly acquired faith. As these followers were over age, there was no possible legal action and this is why they created the first Association of Defense of the Family and the Individual (ADFI) to lobby public authorities against this particular group. Working Session #9 of the 2017 OSCE HDIM was based on the concepts of tolerance and non-discrimination, with a focus on the critical role that education plays in promoting tolerance, countering racism, xenophobia, anti-Semitism, aggressive nationalism and other forms of intolerance, including against Muslims, Christians and members of other religions. Soteria International considered it important to inform the 57 delegates of the OSCE and the representatives of civil society, of the opinion that in order to decrease and eliminate discrimination and non-tolerance we need to look more profoundly to solve the sources that are generating such attitudes on the individual and social level. In this forum, Soteria, therefore, addressed the fact that inner conflicts are generating external conflicts and vice versa. Thus, we must incude a greater understanding and knowledge of others, their traditions, and their spiritual beliefs, thereby eliminating the source of the conflict. It is a major obligation of all OSCE member states to combat discrimination and substantial resources are invested to diminish the symptoms of discrimination and non-tolerance. Still, discrimination and non-tolerance continue to challenge our societies. Discrimination and non-tolerance are often considered to be the offspring of inner conflicts in society, and it is the inner conflicts of individuals which are reflected in the outer conflicts of society. Soteria International would like to suggest that we consider the inner conflicts of individuals as the basis for discrimination and non-tolerance. Finding coherence in one’s own being is the only way to reach a deep sense of meaning in life and harmoniously integrate in society. A society without discrimination and non-tolerance is possible only when individuals become actively aware of their feelings, thoughts, words, and actions. Ultimately, only inner transformation will ensure proper fulfilment in life, allowing peace and harmony to come, thereby, opposing discrimination and non-tolerance at all levels. Addressing the outer conflicting situation as the base of discrimination and non-tolerance disregards the seed inside the individual, always awaiting the right conditions to grow into outer conflict. Conflicts can only be addressed at the individual level, by engaging the individual as a whole, centred in the heart.